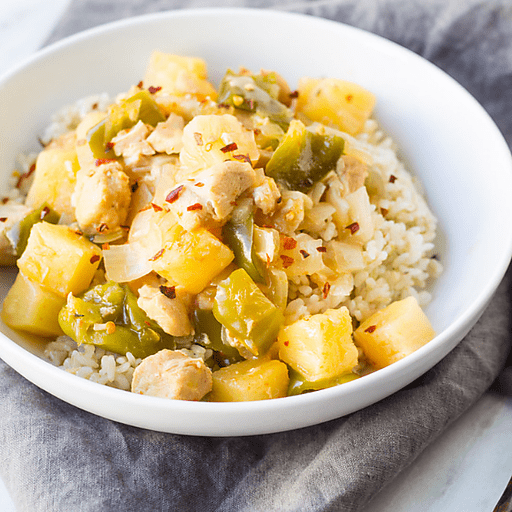 This colorful, kid-friendly dish uses one of our favorite kitchen gadgets, the slow cooker. Add minimally-prepped ingredients to your slow cooker before heading to work and have a delicious meal ready and waiting for supper. Who doesn’t love that? 1. Combine ingredients through bell peppers in a slow cooker. Cover and cook on low for 6 hours or high on 4 hours. 1. Serve over cooked brown rice. Calories 350, Total Fat 4g (Saturated 1g, Trans 0g), Cholesterol 70mg, Sodium 410mg, Total Carbohydrate 59g (Dietary Fiber 4g, Sugars 28g), Protein 19g, Vitamin A 6%, Vitamin C 80%, Calcium 4%, Iron 8% *Nutritional values are an approximation. Actual nutritional values may vary due to preparation techniques, variations related to suppliers, regional and seasonal differences, or rounding.